IBM® Rational® Rhapsody® Developer generates application code for the C, C++, Java and Ada languages including architectural and behavioral views (such as statecharts and activity diagrams). It enables you to import and visualize existing C, C++, Java, Ada and C# code for reference, or develop further and synchronize changes in design or code to keep both in sync. It also supports Eclipse platform integration for an integrated code, model and debug environment. Use animation features for on demand help with design-level debugging to help eliminate defects early. You can automate test creation and execution using IBM Rational Rhapsody TestConductor add-on software as part of meeting ISO 26262 and IEC 61508 standards. You can also visualize and analyze complex requirements with UML, SysML or domain-specific languages (DSL) such as AUTOSAR, DDS or MARTE, or create your own DSL. IBM Rational Rhapsody Developer provides a visual development environment integrated within the IBM Rational systems and software engineering platform for full product lifecycle development. It integrates with Rational products—such as IBM Rational DOORS® Next Generation, IBM Rational DOORS, IBM Rational Team Concert™, IBM Rational ClearCase® and others—for full product lifecycle development. IBM Rational Rhapsody for DoDAF, MODAF, and UPDM is add-on software that enables you to create artifacts that conform to US Department of Defense Architecture Framework (DoDAF), British Ministry of Defense Architectural Framework (MODAF) and Unified Profile for DoDAF/MODAF (UPDM) standards. This software provides traceability from the design back to the requirements, giving you a view of the latest information through IBM Rational Rhapsody Design Manager. It also generates requirements information into the code to assist traceability in the final implementation for compliance with safety standards and provides a parametric constraint solver for SysML parametric diagrams. It includes static model checking analysis, which helps improve model consistency and model completeness. You can respond to changes in an agile way while maintaining consistency for different environments. You can share and review designs with your extended team. The advanced model browser helps engineers sort, organize and edit models. 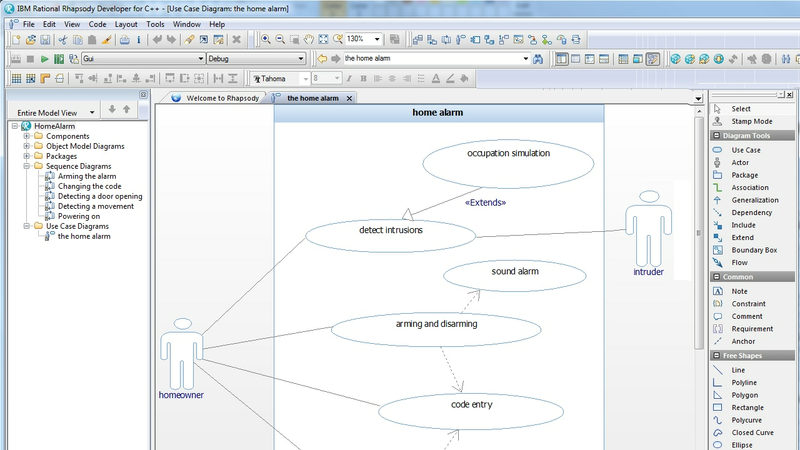 Graphical model comparisons and merging of model elements helps teams work in parallel. A user guide shortens training time and provides step-by-step instructions on applying IBM Rational Rhapsody for systems engineering, embedded software development and testing. IBM Rational Rhapsody Tools and Utilities add-on software provides graphical panels for visual mock-ups of a design. IBM Rational Rhapsody Automatic Test Generation add-on software provides automatic test generation for Rational Rhapsody models, helping to facilitate greater test coverage. IBM Rational Rhapsody Developer Rules Composer add-on software provides customizable rules for code generation to meet the required standards or to generate other programming languages not currently supported. Software requirements for IBM Rational Rhapsody version 8.1.5 can be found at the link below. Hardware requirements for IBM Rational Rhapsody Developer can be found at the link below.